I’m finally catching up on some reviews that I’d hoped to do weeks ago. Last month I took a road trip up to the central coast & decided to make a few fun stops on my way home. I got on the road early enough to make it to Santa Barbara by lunchtime, specifically to go to Adama – a newish vegan restaurant raved about by my friend Kory. I don’t pass through Santa Barbara often, so I took the opportunity to stop & check it out. Sadly, Monday is the one day of the week they are closed for lunch! Phooey. I’d worked up quite an appetite on that first leg of my drive, & I was in beautiful Santa Barbara after all, so I certainly wasn’t about to claim defeat, or hop back on the road with a rumbling tum. Although it had been quite some time since I’d visited, I am quite familiar with Santa Barbara. I lived up there for several years while going to college at UCSB. 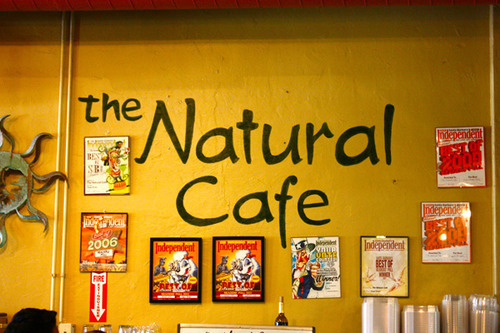 One place I used to frequent quite often for a break from typical college fare was The Natural Cafe. Curious if it was still around, I looked it up & was happy to see that it’s still thriving, & it was just around the corner from where I parked. 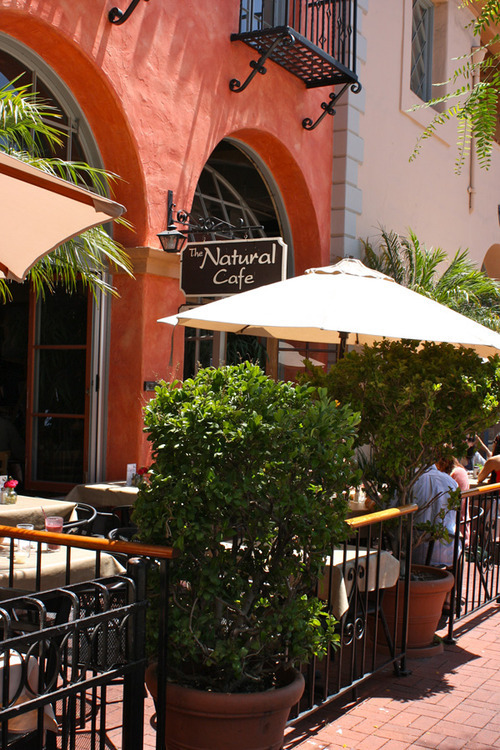 The Natural Café offers a diverse menu featuring poultry, fish, vegetarian & vegan choices. The soups, salads, sandwiches & entrees are prepared fresh daily in our kitchen with good health & good taste in mind. 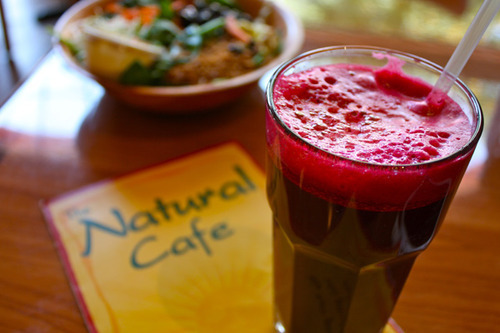 The Natural Café is focused on using fresh, regional ingredients to create healthy & delicious food. It was exactly how I remembered it, same decor, same friendly energy, same fresh & tasty menu. In fact all of my favorite things were still offered – the “Spiritual Spinach Salad,” the“Zog (veggie chili) Dog” & “Tempeh Tacos” & the “Yogi Special.” How was I ever to decide? After a weekend full of food, coconut ice cream & “Cayucos Coladas” I thought it best to eat lightly (especially because I’d planned to make another stop at Native Foods for dinner!) 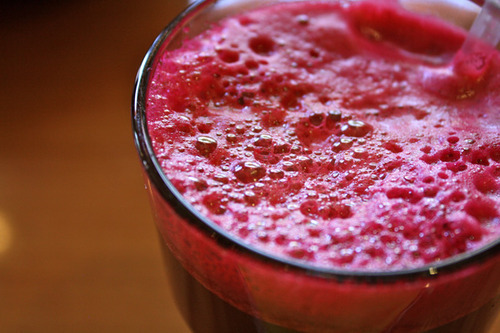 & went with a fresh juice & my all time favorite salad. This spinach salad topped with carrots, olives, artichoke hearts, veggie-bacon bits & sprouts, with lemon -tahini dressing on the side brings back so many memories! 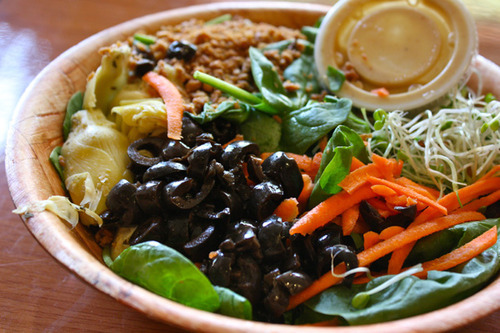 The Natural Cafe is certainly responsible for my love of spinach salad, & salad in general. I used to lug my backpack & books to study over a juice & this very salad. Ah the memories. I don’t know what it is exactly makes me adore this salad as much as I do, but it always hits the spot for me. I love the combination of the crisp veggies, the briny olives & artichoke hearts & the crunchy, savory veggie bacon bits. The mix of flavors & textures is just wonderful. I know I could’ve shared something a lot more exciting than a juice & simple salad, as there are many, many awesome dishes on the menu, but truth be told, sometimes I just want to eat what I want for me, & not worry about it being blog worthy. However, I do promise you I will be making a trip back up to Santa Barbara soon, to revisit The Natural Cafe, check out Adama, & make new discoveries. It’s one of the most beautiful beach town cities in California. I miss it. I can’t imagine why I decided to leave this place.